Are Housing Associations subject to EIR? March 25, 2019 / FOIMan / Comments Off on Are Housing Associations subject to EIR? FOIMan highlights an FTT decision which provides the latest word on accessing information from housing associations. Despite governments undertaking to examine the addition of housing associations to the Freedom of Information Act’s (FOIA’s) coverage, it has yet to happen. The Information Commissioner is the latest to call for this change. There has been debate though as to whether Housing Associations are subject to the Environmental Information Regulations (EIRs). Generally the Information Commissioner has decided not, but last year she put the cat amongst the proverbial pigeons with a decision that an East London housing association was subject due to its ‘special powers’. Lynn Wyeth wrote an excellent piece in the Freedom of Information Journal in the Autumn comparing the Commissioner’s decisions on this issue and seeking to explain why the decision in relation to Poplar Housing and Regeneration Community Association (Poplar HARCA) was different. In summary: it’s complicated. Well, the FTT has now decided that perhaps it isn’t complicated after all: they’ve upheld Poplar HARCA’s appeal and have concluded that it is not subject to the EIRs. In the course of the appeal, the Commissioner in fact suggested that she’d got it wrong in an earlier case (Richmond – FER0700353), which explained the variation. The FTT agreed that the Commissioner had got it wrong, but in their view it was the Poplar decision that was incorrect. As with a lot of disputes over the coverage of the EIRs in the last few years, the case revolved around the Fish Legal case that was referred to the European Court of Justice in 2014. That case examined the definition of public authority at regulation 2(2)(c) of the EIRs and the underlying Directive. It concluded that to ‘carry out functions of public administration’, a body had to have been ‘entrusted with the performance of services under a legal regime’; the services had to be of public interest; and it had to have been vested with ‘special powers’ in order to provide those services. In the Poplar case, the FTT found that Fish Legal had defined ‘legal regime’ as meaning that there had to be a national law entrusting the body with the performance of those services. This was where the ICO’s case fell down: the FTT could not identify such a law. Without the ‘narrow’ definition of a legal regime set down in Fish Legal, the FTT would have taken a different view – but effectively its hands were tied. For now then, private housing associations will not be subject to FOI nor the EIRs. Until the government either chooses to extend FOI and the EIRs to them, or inadvertently entrusts them with performance of services under another national law. Or until there is a successful appeal to the Upper Tribunal – whichever of these is sooner. London councils: how good are they at FOI? March 18, 2019 / FOIMan / Comments Off on London councils: how good are they at FOI? 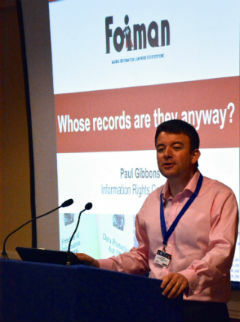 FOIMan highlights a new report from the Campaign for FOI on good practice – and whether London councils are meeting it. some council guidance contained errors such as suggesting that staff could charge applicants. The report makes 14 recommendations including quarterly publication of statistics (which is in any case what is required now under the new s.45 code), that the ICO be clear with authorities that they could face enforcement action, that stats, internal guidance and disclosure logs be published, and that authorities be more helpful to applicants. The full report can be read via the Campaign for FOI’s website (and you may want to consider donating to the Campaign if you find the report interesting). If you’re working for a council and struggling with FOI, you will find The Freedom of Information Officer’s Handbook addresses all of these issues. You can, of course, also get in touch for training and for help with revising FOI policies and procedures – if that’s of interest, drop me a line. 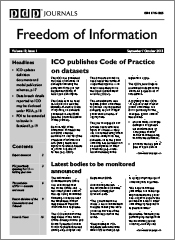 FOIMan comments on the ICO’s new draft FOI strategy ‘Openness by Design’. A few weeks ago the ICO published its draft strategy for FOI and access to information over the next three years. It is still open for consultation until 8 March so if you have a view on the strategy, make sure you submit a response. I’ve been reading it with a view to doing the same, but I thought I’d make some initial comments here. Work in partnership to improve standards of openness, transparency and participation among public authorities in a digital age. Provide excellent customer service to members of the public and public authorities and lead by example in fulfilling our statutory functions. Raise awareness of access to information rights and make it even easier for the public to exercise their rights. Promote the reform of access to information legislation so it remains fit for purpose. Develop and sustain our international collaboration. It’s hard to disagree with these statements of intent but that’s because they’re pretty bland – with a few tweaks they could have been copied and pasted from pretty much any corporate strategy document (the Scottish Commissioner’s strategic plan for 2016-2020 lists some very similar priorities, but they are worded more specifically). It would be good to see something more meaningful being promised. There are certainly opportunities to do more on FOI so it is not that there is nothing to say. The more detailed exploration of these strategic goals is more enlightening. There are some hints of changes in approach (such as the collection of ‘systematic feedback’ from applicants and authorities). Strategic priorities are listed. The most striking of these are plans to develop a self-assessment toolkit; assessing the feasibility of transparency impact assessments along the same lines as Data Protection Impact Assessments; promoting digital means to enhance transparency; and building the case for changes to FOI (see my last post for more on that). Much of this is laudable in principle but is a bit, well, er…fluffy. Do we really need the ICO to develop a ‘service charter’ to improve matters? If money is tight on the FOI side why is so much attention given to international relationships (I appreciate I’m starting to sound like the ERG here, but it’s a fair question)? Given the volume of requests that many authorities are struggling with, should the ICO really be devoting more of its scarce resources to increasing awareness amongst the public of FOI (it is part of the Commissioner’s statutory role to do that, but is it a priority over other things at present?)? Come to that, why only ‘assess the feasibility’ of impact assessments? The Commissioner has been talking about them for almost a year so shouldn’t they have assessed the concept already? The few concrete ideas mentioned in the strategy seem to involve adding extra red tape to the FOI and openness process – whether it be impact assessments or self-assessment toolkits. There’s lots of talk of ‘working in partnership’ with stakeholders, ‘using feedback’ and ‘develop engagement channels’. But aren’t the ICO already doing this? Some of the priorities outlined are so vague and amorphous that it is hard to know what they really mean. 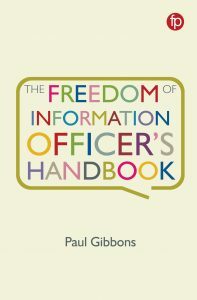 One of the things that struck me when I was researching The Freedom of Information Officer’s Handbook was how little support practitioners get in doing their jobs. The ICO rightly points out that FOI’s benefits are not always recognised by public authorities, and that too much energy is spent on complaining about its cost. But my concern is that this strategy in its present form is not going to help win practitioners and their colleagues over, nor help them to improve their performance. And there are specific and measurable things that the ICO could do to help practitioners and foster a more positive attitude to openness. be seen to take on even the most powerful public authorities if they are not cooperating. I don’t need to bang on about certain government departments as plenty of others better placed than me to comment (as here and here) have done that. I understand that sometimes there may be more effective means than formal action to move things on, but it would be good if this strategy gave some indication of a new approach and what the ICO is prepared to do in the face of intransigence. In short, practitioners need more concise and usable guidance; they need practical assistance; they need to be able to compare their performance to others; they need to know that if they tell their colleagues that they should comply, that they won’t look silly when government departments are let off the hook. The ICO claim that one of their values is to be ambitious. I think they should put more emphasis on being ‘service focussed’ and in particular provide some more quality support for practitioners. Without educated and empowered practitioners, everything else in FOI falls apart. At the same time, where an authority is not playing ball, there needs to be less partnership and more confrontation. Get the basics right and everything else will follow. The above comments may be unfair criticism of what is intended to be a high level declaration of intent. However, whether it be here or elsewhere, the ICO need to demonstrate that they are going to promote and enforce FOI compliance in a more practical and active way. FOIMan reports on a new report from the Information Commissioner calling for FOI to be extended to cover a wider range of bodies. Wasting no time, the ICO have laid a report before Parliament called ‘Outsourcing Oversight: the case for reforming access to information law’. The report highlights examples of access to information laws – primarily FOI and EIR – failing to facilitate scrutiny of public service provision, from information about reinstatement works following the London Olympics to fire safety inspections of hospitals and other public facilities. The report uses case studies like these, together with polling data and commissioned research to support its conclusions. the government should conduct a review of proactive publication requirements in relation to public sector contracts including publication scheme provisions. All of these recommendations are, of course, to be welcomed by anyone who supports greater transparency of public institutions. The report, and particularly the supporting research, will no doubt keep debate on this subject alive. The rub will be whether any of this will actually happen at a time when government has a few other things on its collective mind (and will do for some considerable time to come).